First of all you need to blow out your eggs, i.e. get rid of what’s inside. 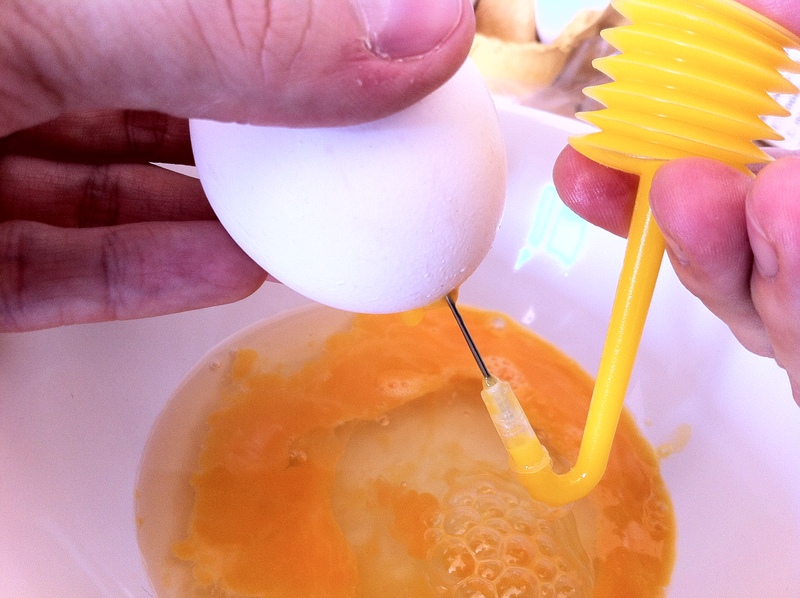 The way we used to do it with my mum is to make two holes in your egg with the needle (one hole at either end), and then very carefully blow into one so that the insides of your egg come out the other. You have to be very patient and gentle, otherwise the egg will break, especially when the yolk is straining to get out. 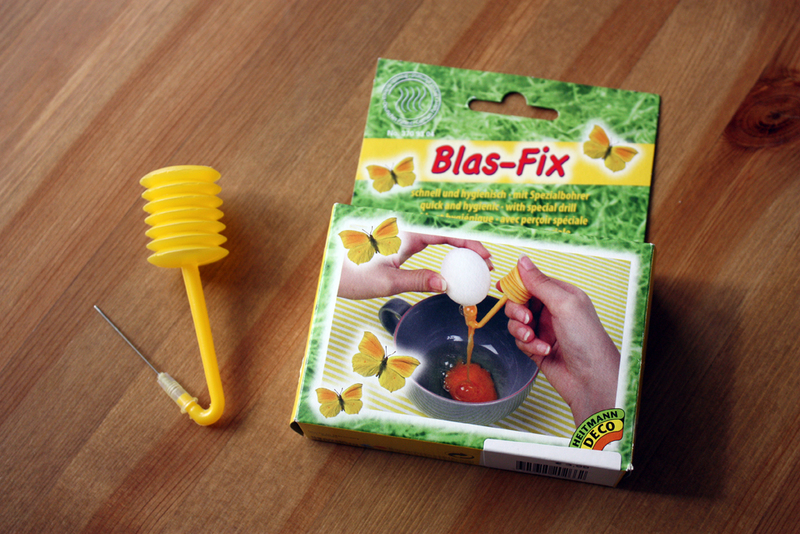 I discovered a very cool gadget when we were living in Berlin called “Blas-Fix”, which translates as “blow-quick”. You can order it online here in the UK via Amazon (affiliate link). At first I thought it was one of these unnecessary kitchen tools, but I decided to give it a try anyway and wow, not a single broken egg and really quick too. But if you don’t have one, my mum’s method will work too. 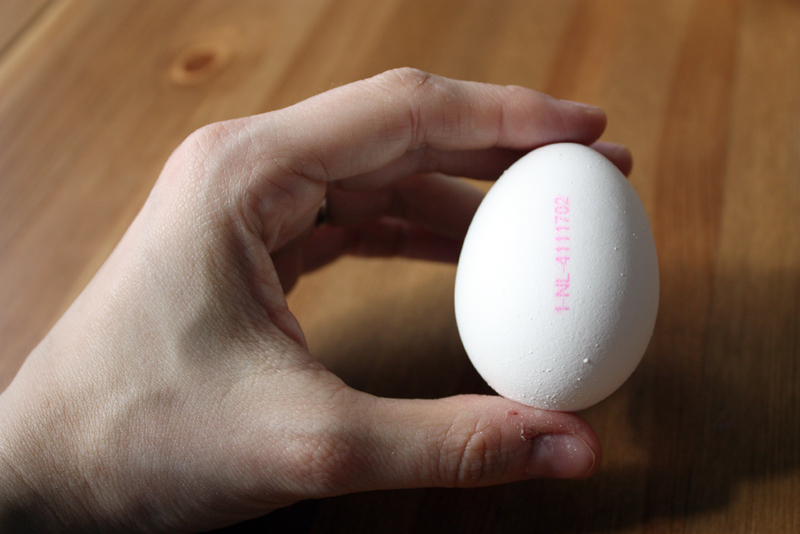 Whichever method you use, don’t throw away the insides of the eggs! Catch them in a bowl and save them to make some tasty scrambled eggs for lunch or dinner. 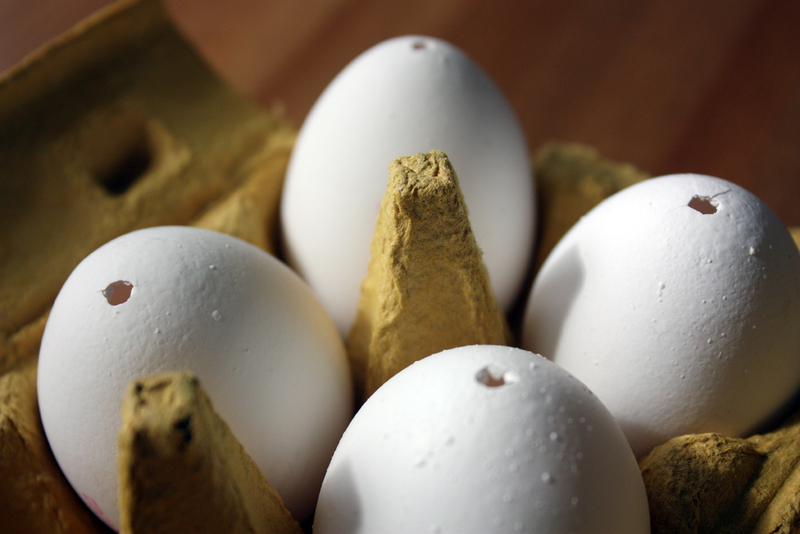 Once you’re done, gently wash the eggs and leave them to dry. Here’s a picture of the eggs, ready to start, just to show you roughly how big I made the holes. Although you only need one hole with the ‘Blas-Fix’, I still made two to thread my ribbon through later. …so I used some white acrylic paint to paint over them. You can skip this step, e.g. if you are going to be painting your eggs all over. Once the white paint was dry, I painted my design. Well, I say design, I kept it simple with coloured dots. But you can off course paint any patterns you like. 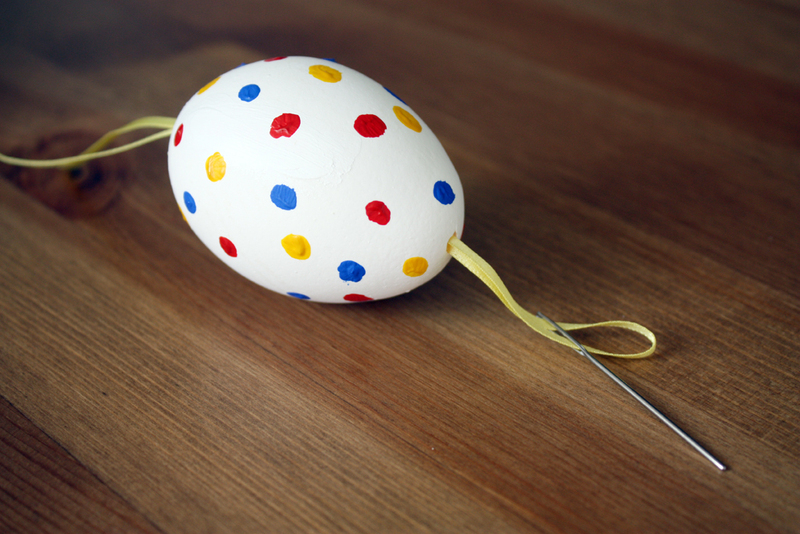 Once all that paint was dry too, I gently threaded my ribbon through the eggs (I used ca. 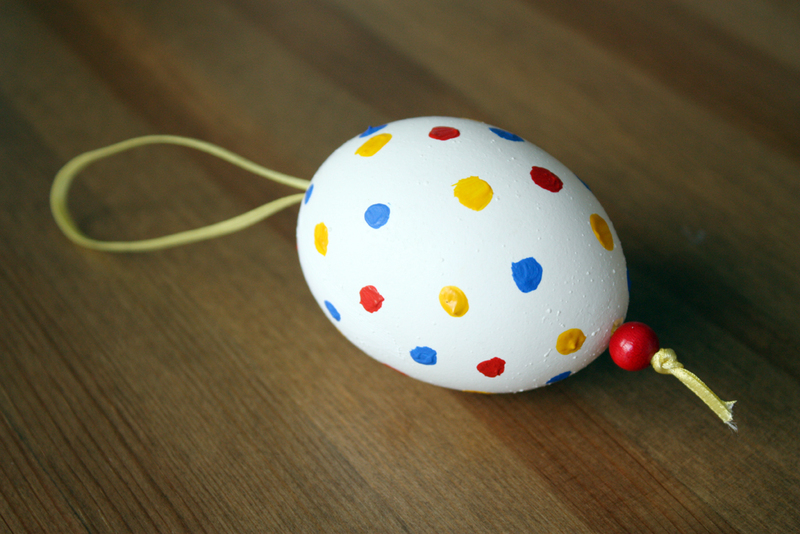 35cm ribbon per egg). It was a bit tricky, as the needle was just shorter than the egg, but the technique that worked in the end was the push the needle all the way in, then gently jiggle the egg about until the point of the needle peeked out the bottom hole. Then I was able to pull it through. The last thing to do was thread a wooden bead on to the ends of the ribbon and tie a knot to keep them in place. I used a different coloured bead for each egg. 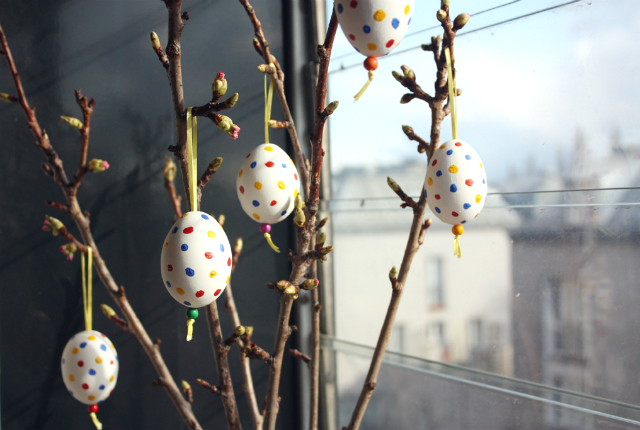 Now all you need to do is buy a couple of nice branches (or if you don’t live in the middle of a big city like me, go out and collect some), stick them in a vase, and hang your eggs on them. 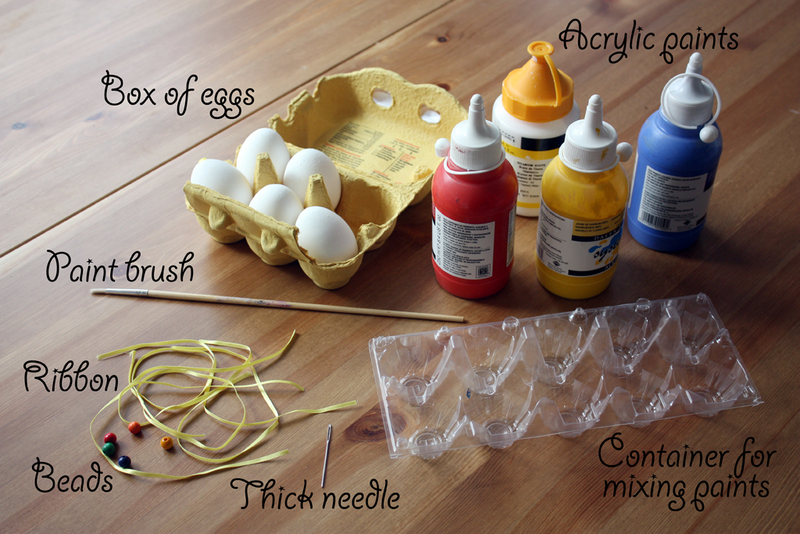 This is a really fun activity to do with kids (though your egg tree may not look so uniform, depending on your kids’ artistic skills). 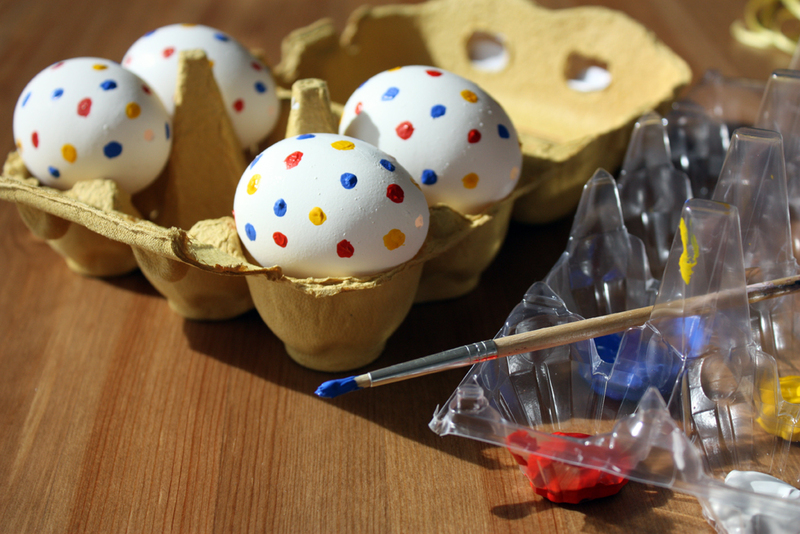 It’s up to you whether you want to include them in the messy part of the egg blowing, or whether you want to prepare the eggs in advance and just do the painting together. 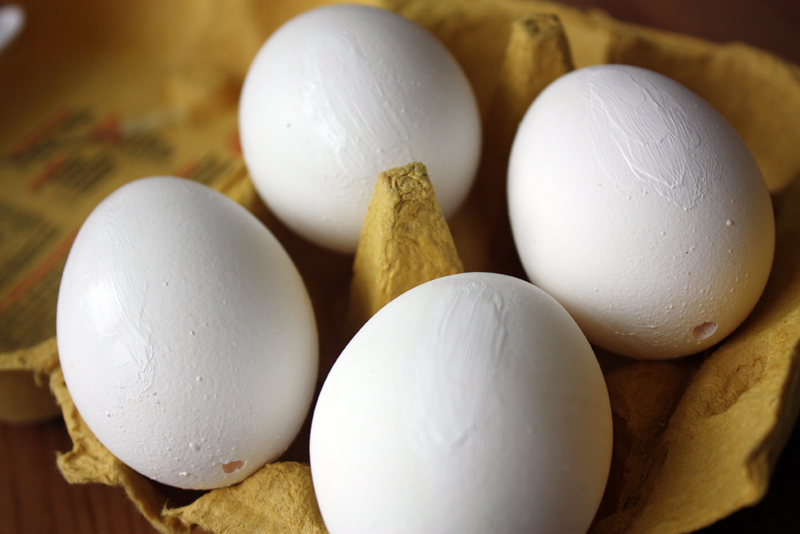 It’s also a good idea to prepare extra eggs, just in case there is some breakage, as they are a bit fragile once they are empty. 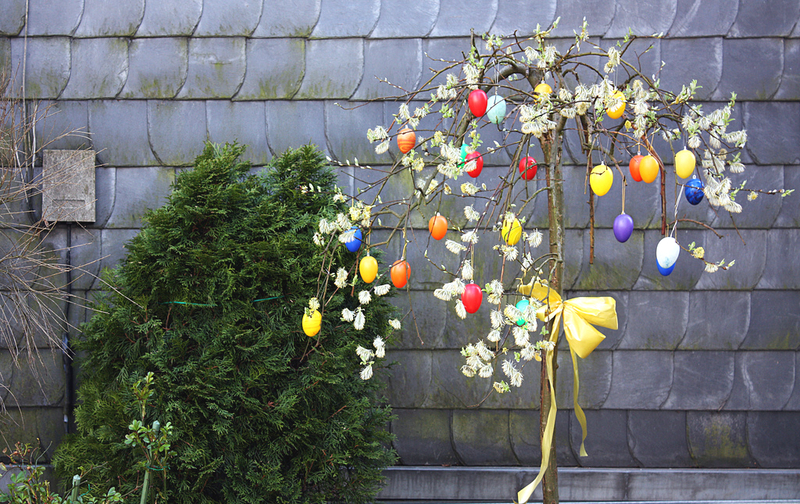 If you make an egg tree this Easter, I’d love to see your photos! Feel free to share and tag me on Twitter or Instagram. What a really lovely idea. I love Easter, more than Christmas really. All the fun but none of the stress! What a great idea! For all children who love the Christmas tree this will be so much fun. This is such a cute idea, it would keep my twins busy for ages!